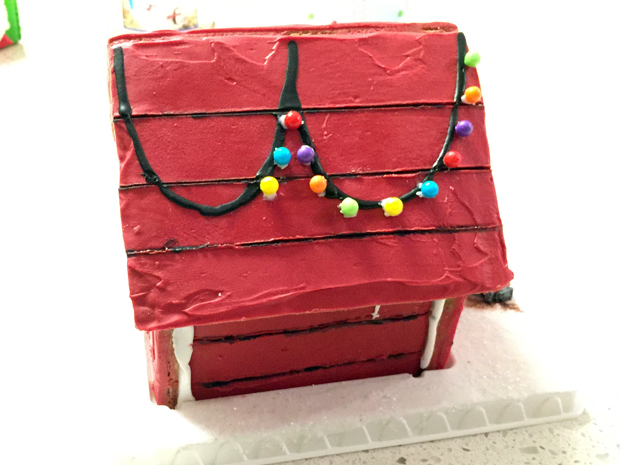 Make Your Own Snoopy Gingerbread Doghouse — Red Car Baking Co.
A fun tradition in my house is to build a gingerbread "something" for the holidays every year. It's fun to bounce ideas around during Thanksgiving dinner in anticipation of building it that following weekend! Now anyone who's built custom gingerbread houses or structures knows what a pain-in-the-you-know-what it is to make the templates, bake the gingerbread, etc. This year I wanted to take it a little easier on myself, so we decided on a project that I knew we could accomplish with a store-bought gingerbread house kit. It's super easy and only requires a few extra tools and your imagination. It's a great project to do with kids or your significant other (like me) during the holidays. Here goes! *Optional: These tools make it easier to decorate, but by no means are necessary. You can use whatever you have handy in your kitchen. A gingerbread house means to me that it doesn't have to be perfect. It's supposed to be a little messy, but a whole lot of fun! 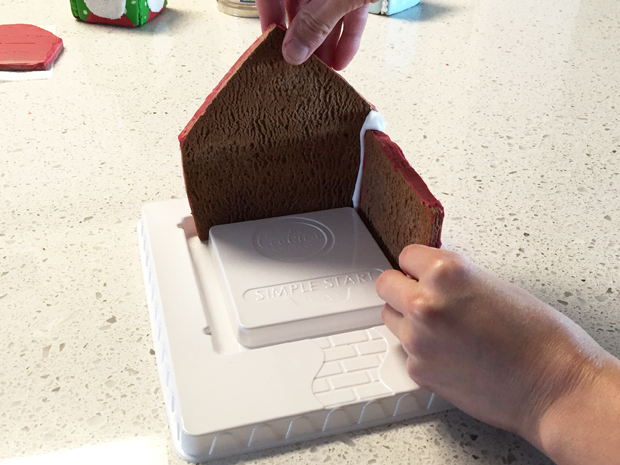 Start by removing the gingerbread kit from its box. This is what came in my set: the house, plastic stand, royal icing packet, some small round candy balls, and gumdrops. Next, lay your gingerbread pieces on a wire rack with a piece of parchment paper underneath to catch the run-off. You can also use paper towels, foil, plastic wrap, whatever. It's just to make clean up easier in the end. Melt your candy melts in a microwave safe container. I'm not very patient, so I microwaved them on high for 30 seconds, stirred and repeated until they were nice and melted. You can add a tablespoon of shortening to soften the melts if you feel they are too stiff to spread (I didn't). Then, pour some of the candy melts onto your gingerbread like so. And spread using your butter knife or spatula. 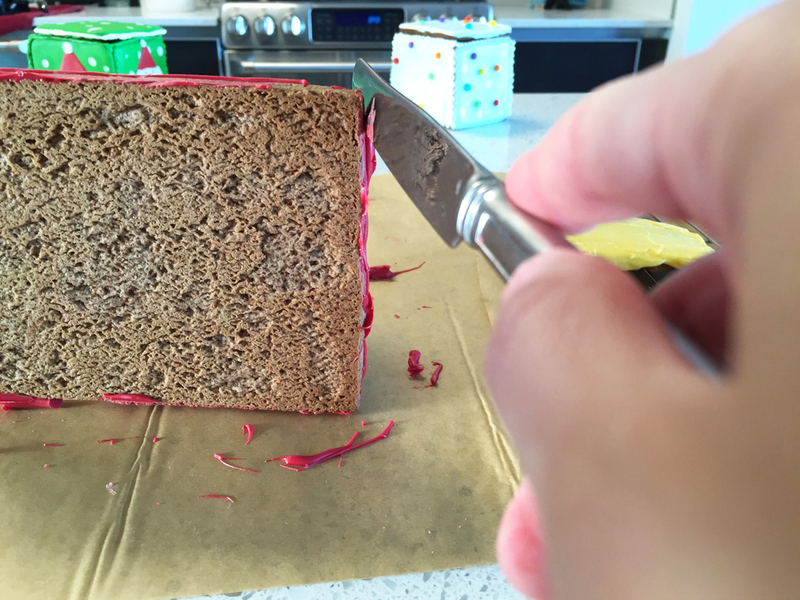 Try to get an even layer all across the gingerbread, but don't worry too much about getting it super smooth because that's where the heat gun/blow dryer come in handy! Here's a close up of my less-than-perfect gingerbread panels! Let them set up for about 30-45 minutes before moving on to the next step. 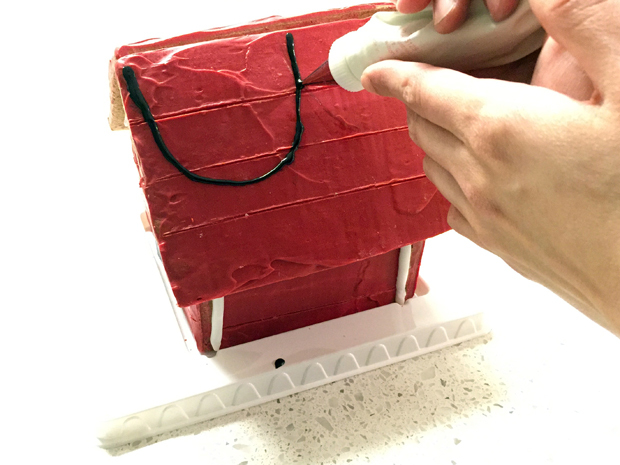 Take your heat gun(if you're using a blow dryer, make sure you can get it as hot as you can), and pass it over a gingerbread panel a few times until it glistens again. Then using the back of a butter knife, or in my case my scraping tool, give it a light pass over the top. You may need to do this a couple of times to achieve a smooth finish. Remember, it doesn't have to be perfect because it's going to get decorated anyway! Now wait 30 minutes and make the wood indentations about an 1" apart. I ended up having to use a knife to score them even deeper. Let these set up for at least an hour to make sure they're dry. After the panels have set, you can dip a clean butter knife into a hot water bath for a few seconds. Wipe it dry and run it down the side of the gingerbread panel, scraping off any excess candy melts from around the edges. Now to build Snoopy's doghouse! First, massage your icing bag for a few minutes to get it nice and soft. Then cut a small hole at the corner with a pair of scissors. 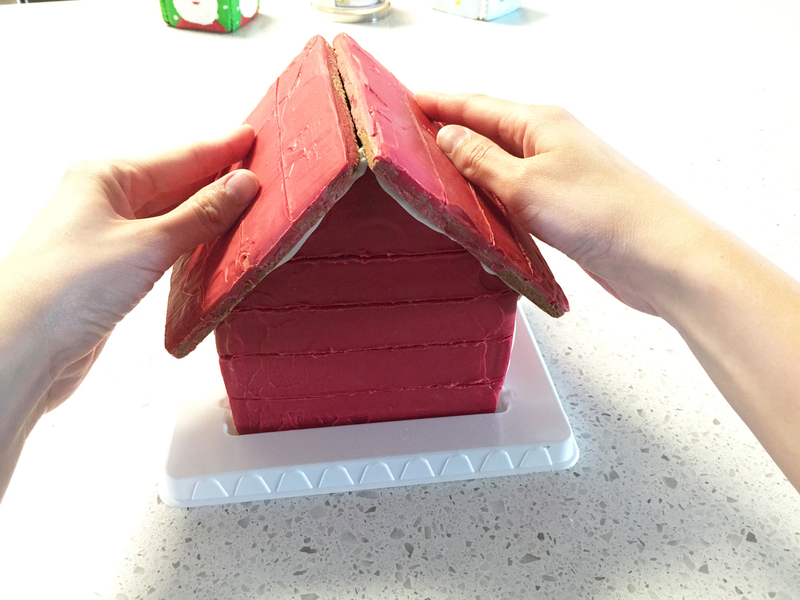 Put some icing along the edges of your gingerbread and use the stand to keep the panels upright. If your kit didn't come with a stand, use canned food or a book to help prop them up. 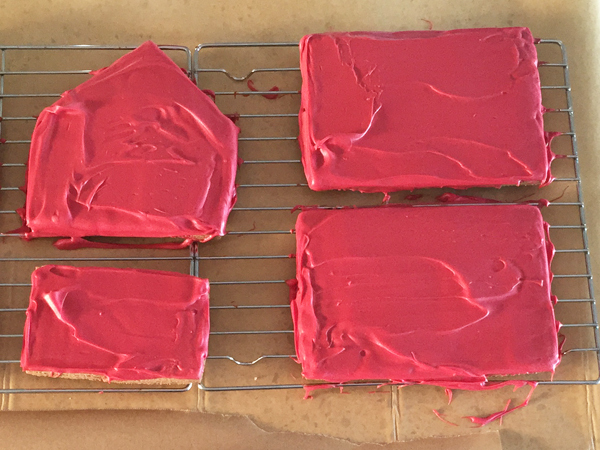 The roof is tricky and you'll have to hold the panels in place for several minutes until the icing hardens enough for you to let go. 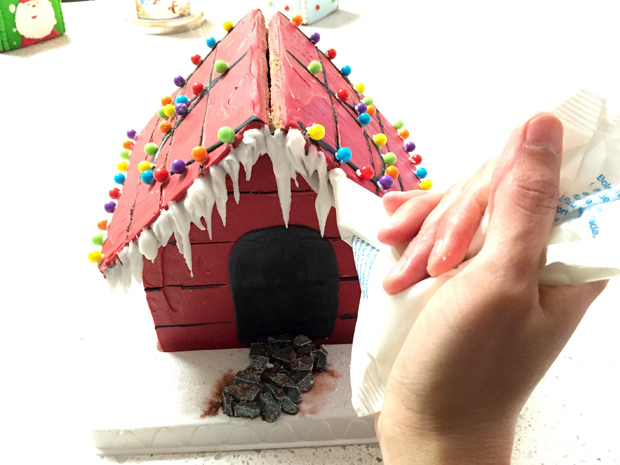 Cut Snoopy's door out of thinly rolled back fondant. Adhere it to the doghouse with water. If you don't have fondant, color a bit of icing with black gel food coloring in a bowl (you may need to thin it down with water) and paint it on. For the latter step, it may be easier to do this while the house is not yet constructed. Using your piping bag (or sandwich bag), pipe two black U-shaped lines on both rooftop panels. To get black icing, mix black food coloring with a tablespoon or two of your prepared icing in a bowl. Take some black icing and paint it into the wood lines you made earlier. Thin some of the white icing with water in a bowl. 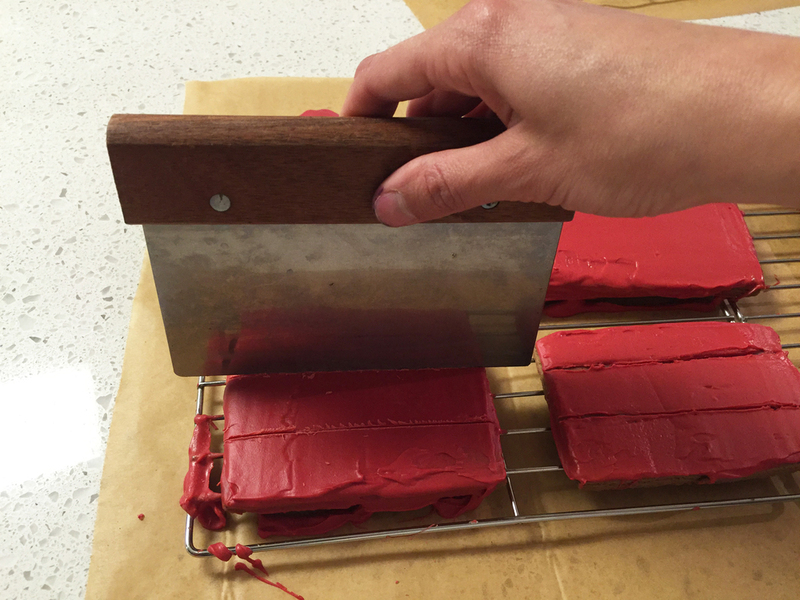 With a clean paint brush, paint the icing around the plastic stand and immediately pour white sugar on top. I used candy rocks for the path leading to Snoopy's house, but you can use whatever you'd like. My SO had "light" duty so this is where here took over. He dipped the candy balls in a little of bit icing and placed them along the black lines I piped earlier. He also placed them along the bottom of the roof. To create a snow effect, I poured little confectioner's sugar inside a fine mesh strainer and gently tapped it over the top of the doghouse. Lastly, and this is optional, I made a Snoopy figurine and set him on top in his iconic pose. I wonder what he's thinking about now? I hope you enjoyed this tutorial! It was a lot of fun making it. Post your comments and questions below. I would love to see your recreations. Tag me on Instagram @redcarbakingco!